The top Thai beers, LEO, CHANG CLASSIC and SINGHA, have all been the most popular Thai beer in Thailand’s ever evolving domestic beer market at some time within the last 20 years. Leo, with a 46% share of the 2016 domestic market, has been Thailand’s most popular beer since 2009 when its annual sales surpassed the sales of the original Chang beer. 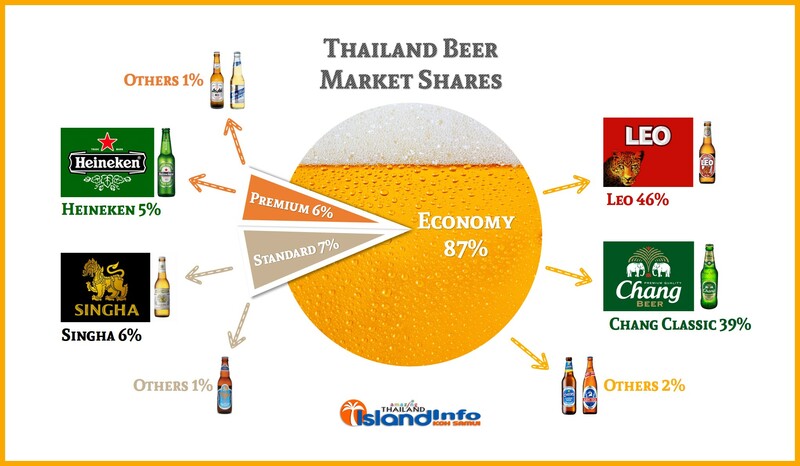 Now, Thailand’s two most popular beers, Leo and Chang Classic, account for 85% of all the beer sales in Thailand. The trend in recent years has seen continued growth in the economy beer segment as higher excise taxes and a weaker economy have persuaded consumers to trade down from standard and premium beers to either Leo or Chang, the market leaders in the economy beer category. Is the Thai beer market still growing? Yes, according to this comment from, Edmond Neo Kim Soon, chief executive officer for Chang beer in Thailand, “Thailand’s beer market is looking to expand 3-4% to about 18 million hectolitres this year after dropping sharply by about 5 per cent last year”. Thailand’s weather is hot day and night…. living or being a tourist in this tropical paradise works up a thirst. 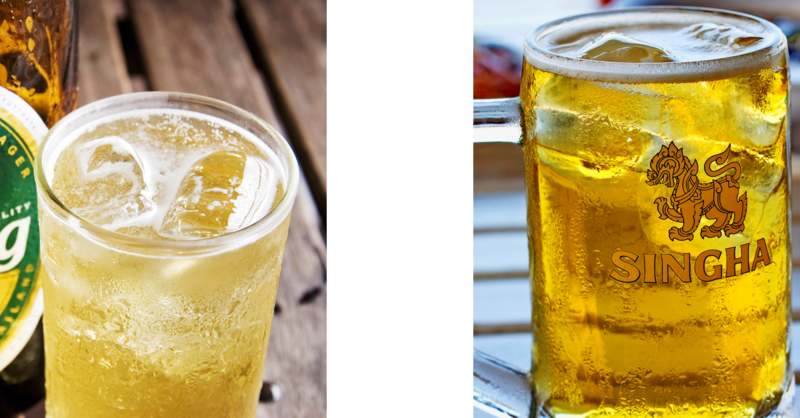 Many bars, restaurants and social gatherings are outdoors and your beer does not remain cold for very long. So, you must decide… Ice or Condoms? One of the local solutions for keeping your beer cold, is to put ice in the glass with your beer. Some drinkers enjoy their beer this way, while others find adding ice to their beer unpalatable and prefer to drink their beer without the watered down taste that occurs when the ice melts. You will always be asked if you want ice, it is not added automatically, so the choice is yours. Another solution is to put you beer bottle into a condom, no, not that sort of condom! 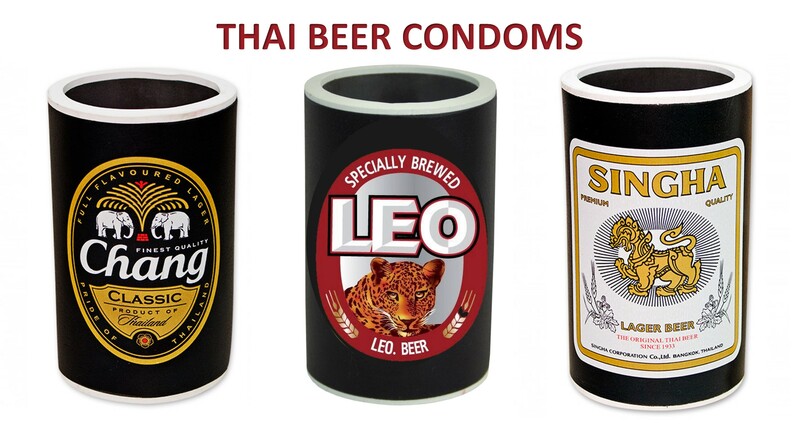 The foam beer cooler that you put your bottle into is called a “condom” in Thailand, they are readily available at most bars. Leo Beer, brewed by the Boon Rawd Brewery, was launched in 1998 in response to the growth and popularity of Thai Beverage’s Chang beer, a weakening economy and the declining sales of its own major beer brand at the time, Singha beer. Leo was positioned as an economy beer, with a retail price slightly higher than Chang, but cheaper than Singha. 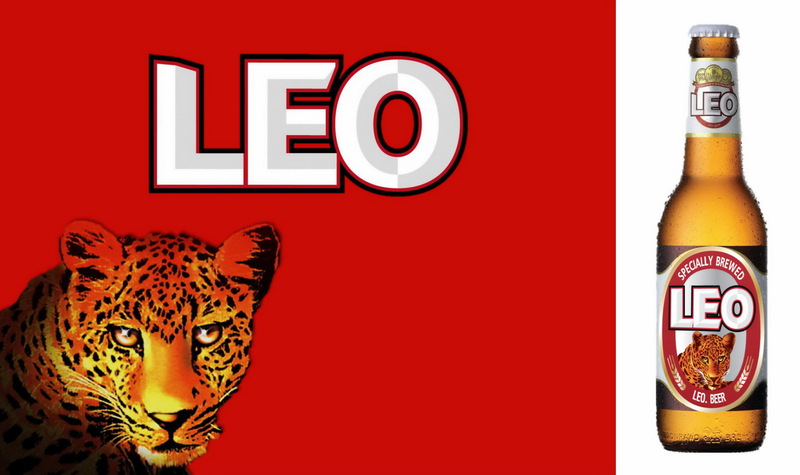 The marketing strategy was to position Leo as an easy to drink, affordable but socially cool beer, that would appeal to the younger crowd and importantly, with an alcohol content of 5%, much less than the 6.5% of its targeted competitor, Chang. The first bottle of Beer Chang rolled off the Thai Beverage production line on April 4, 1994, at its first brewery, in Bang Baan district, Ayutthaya. Almost overnight, Chang Beer, a pale lager, proved to be remarkably popular. 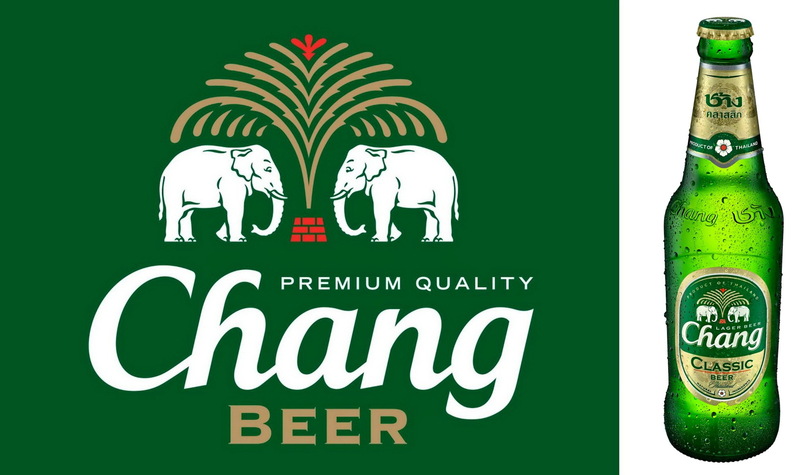 Sales of Chang beer increased by the day and within three years it had captured over 50% of the Thailand domestic beer market and peaked at 64% in 2003. However, by 2009, Chang’s market share had slumped to a low of 30% and hovered in the low 30’s until 2014. 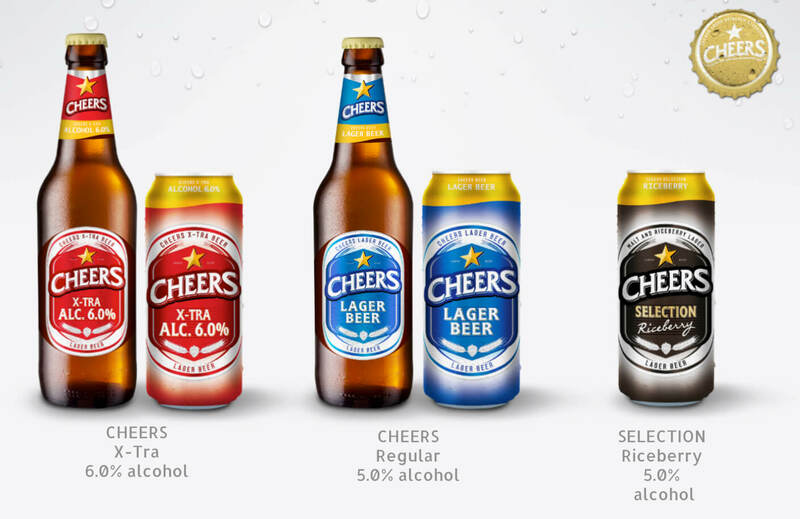 In August 2015, Chang underwent a fundamental brand re-positioning, ThaiBev invested heavily in packaging and marketing to remove the stigma of Chang being a low-income beer and consolidated its offer of three beer brands, Chang Light, Chang Export and Chang Draught, into the single brand, Chang Classic. A sleek green bottle and a long-necked fashionable shape provided Chang Classic with a more contemporary and appealing visual appearance. 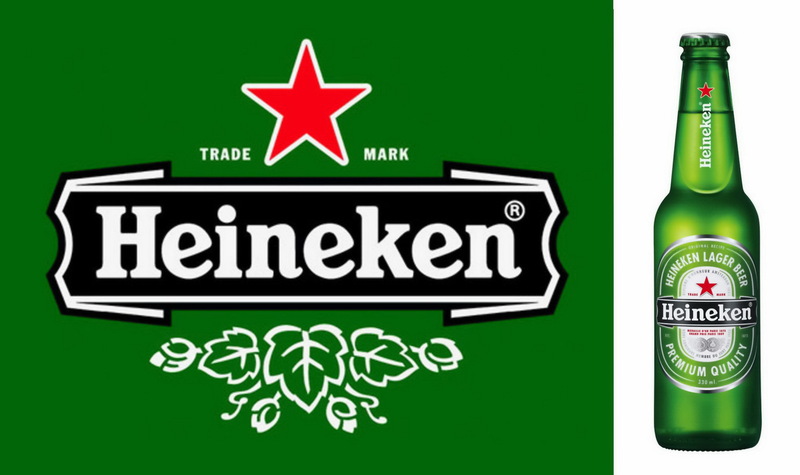 The beer itself was reformulated, reducing the bitterness significantly and a 20% reduction in alcohol content from the original 6.4% to a much lighter 5.5% alcohol by volume. The new Chang Classic appeals to a much broader market base, in 2016 Chang Classic’s domestic market share had climbed to 40%. 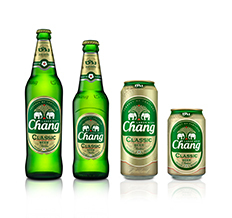 Chang is synonymous with the taste of Thailand for many of its international fans, but it is also well-known as the long-term sponsor of Everton FC. Chang Beer has been the shirt and main club sponsor of Everton FC since 2004. This partnership between Everton FC and Chang Beer is the longest running sponsorship in the Barclay’s Premier League. Locations 1. Cosmos Brewery (Thailand) Co. Ltd.
2. Beer Thip Brewery (1991) Co., Ltd.
3. Beer Thai (1991) Plc. Phya Bhirom Bhakdi his long-coveted license to brew beer. This date is regarded as the official birth of Boon Rawd, and its anniversaries are celebrated on this day. 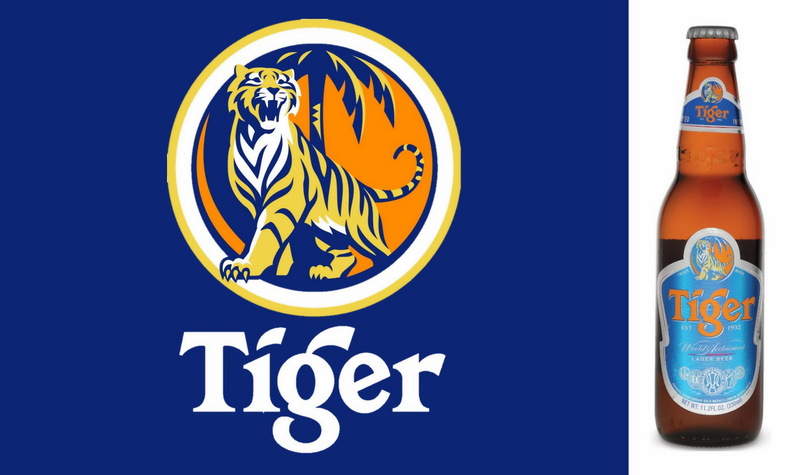 Boon Rawd Company launches two beer brands, Golden Kite and Singha, both beers retail selling price is 32 satang. Within 1.5 years of the opening of Boon Rawd Brewery, 40% of the beer consumed in Thailand was made in Thailand. Boon Rawd begins exporting and launches Singha beer into the International market in 1970. The first cans of Singha beer were produced in 1989. The “Singha” is a powerful mythological lion, found in ancient Hindu and Thai stories, the image displayed on all bottle and cans. Available worldwide since 2007, it is enjoyed a popularity in its world-wide consumption in recent years, due in partially to a four-year marketing partnership with English Premier Football Club Chelsea. 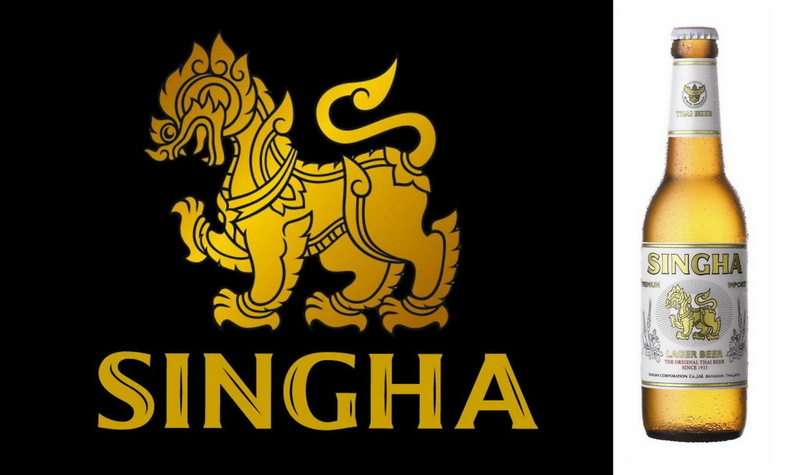 Singha, pronounced “beer Sing” by the locals, still wears the crown for being the most popular Thai beer Internationally. . The market shares used in this article have been calculated using a combination of: the 2015 Thaibev annual report, Government beer production and taxation data, The Nation, CIMB Market Research, The Nation Update and the Journal.beer.